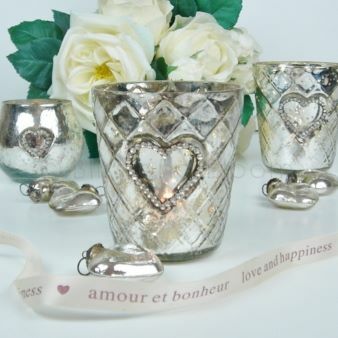 This gorgeous French style sparkly heart tea light holder x 1 is so pretty, made of glass with an antiqued vintage look and a jewel heart in the centre. So glamorous. Displayed in sets of 3 on a dining table or mantel piece they look so gorgeous, and they are a lovely generous size. H 10cm Diameter 9.5 cm approximately.